With many web designers having access to similar online resources for stock photography, textures, and vector illustrations, the possibility of repeated patterns online is pretty high. One way to ensure that your design is truly unique is to create an offline design element toolbox. Creating a toolbox gives you access to unique elements in a timely fashion so that when you are under a deadline or strict budget, you already have a jackpot of resources that'll make your design pop. By investing time early, you will be prepared in a time crunch. My first recommendation is to go on a Design element expedition -- a trip where your main goal is to collect samples of interesting design materials. The key here is to stay focused on your toolbox, this way you can look at things in the environment from a different point of view, really honing in on how things may translate to the web as artistic elements. My local art store, Pearl Paint, carries everything from traditional art supplies to handmade paper. While I look for interesting textures, I also browse the paints and stencils to get ideas on interesting new applications. While many artistic textures can be recreated in Photoshop, you are guaranteed an authentic and improvisational look when using the real deal. Also, check out more non-traditional materials such as metal or clay. You can always create an interesting effect in one of these mediums and photograph it. Take your camera out on a walk with you and just look for textures. Go by yourself so that you don't get distracted and look everywhere you step. The most ordinary objects can be abstracted into the most fantastic design elements. I have taken "design element expedition" walks both in parks and in urban areas, and I would recommend trying to collect samples from really condensed metropolitan areas. While beautiful texture can be found in nature, the most unique samples are found where man-made meets the wear and tear of the great outdoors. Take a look at signage, advertisements, and graffiti, and try to snap really high-resolution photos of each. 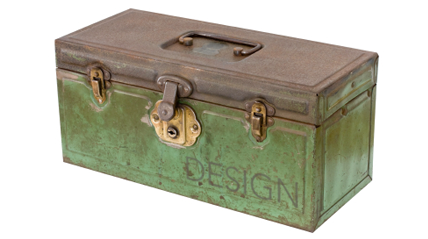 The "toolbox" doesn't necessarily have to be an physical box . . . but it really helps. Take all of your fun new fabric, clay, and paint, then organize it to be accessed when you need these elements in a hurry. While it would be great to have your toolbox 100 percent digital so you can access it anywhere, anytime, that limits the amount of possibilities for the future. Maybe you want to carve a logo into clay, but you don't really have the right project for that venture now; store the clay in a box and hold out for just the right opportunity. For accessing stuff in a snap, spend some time scanning in the more interesting elements and creating files for them. Store them on a thumb drive or server that you can access all the time.